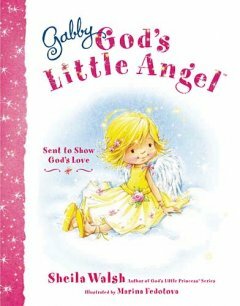 Moments: Book Review - "Gabby, God's Little Angel"
Shelia Walsh has begun a new series for children! The first book is "Gabby, God's Little Angel." Portraying the message of Psalm 91:11, "He has put his angels in charge of you. They will watch over you wherever you go," Walsh has captured this message in her story. Gabby is an adorable angel who has a few mishaps of her own and she is to watch over a little girl, Sophie, who is quite a bit like herself. Sophie is a busy little girl who needs a lot of protection as Gabby quickly learns, but Gabby is determined to show Sophie God's love. This is a really cute story, my daughter loves it. The book is filled with vibrant illustrations that are beautiful! However, it almost seems as if there is too much going on as some of the words in the story are bigger and in color. They take away from the illustrations and are a little distracting.